Do not apply or add oil or grease to the belt tensioner to prevent abnormal noises from the belt tensioner pulley, belt squealing, etc. Do not allow oil or grease to adhere to the moving parts of the belt tensioner, as this may cause malfunctions. 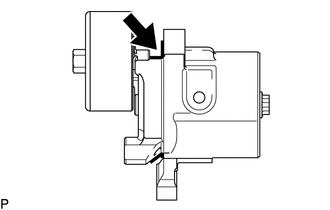 If oil or grease is on the location indicated by the arrow, replace the belt tensioner. 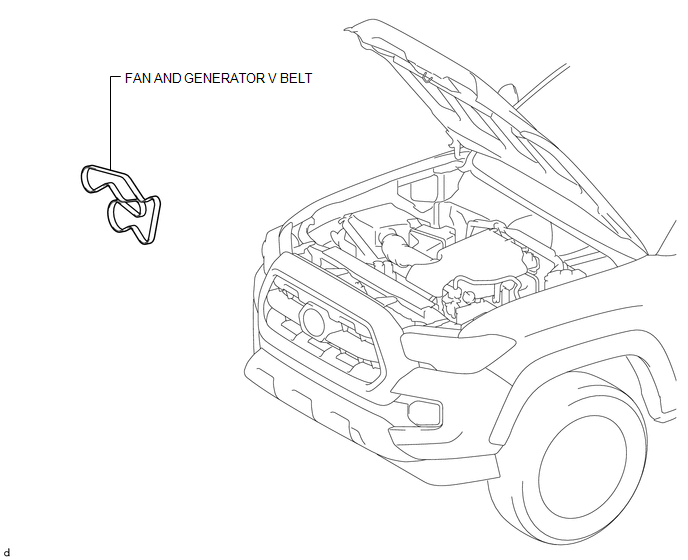 (a) Set the fan and generator V belt onto every part. 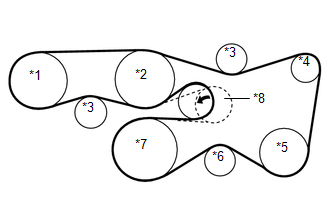 (b) While turning the V-ribbed belt tensioner counterclockwise, remove the pin. Make sure that the fan and generator V belt is properly installed to each pulley. (c) Check that the belt fits properly in the ribbed grooves. Make sure to check by hand that the belt has not slipped out of the grooves on the bottom of the pulley. 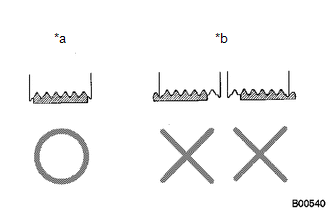 If any of the following defects is found, replace the fan and generator V belt. Check with your hand to confirm that the belt has not slipped out of the grooves on the bottom of the pulley. If it has slipped out, replace the fan and generator V belt. Install a new fan and generator V belt correctly. (a) Check that nothing gets caught in the V-ribbed belt tensioner by turning it clockwise and counterclockwise. 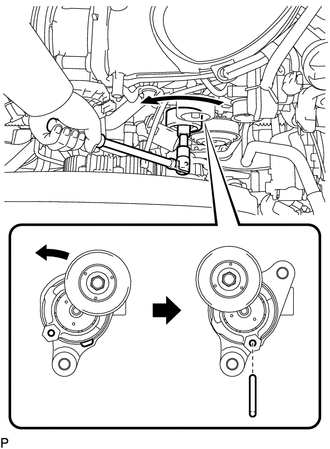 If the result is not as specified, replace the V-ribbed belt tensioner. 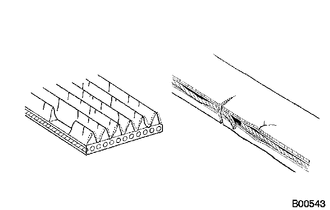 (a) While turning the V-ribbed belt tensioner counterclockwise, align the service hole for the V-ribbed belt tensioner and the belt tensioner fixing position, and then insert a bar of 6 mm (0.236 in.) into the service hole to fix the V-ribbed belt tensioner in place. The pulley bolt for the V-ribbed belt tensioner has a left-hand thread. (b) Remove the fan and generator V belt.